Established in 1849 and adored ever since, Brown Thomas is home to a dazzling array of designer brands in beauty, fashion, accessories and items for the home. The Irish chainlet of department stores boasts four locations throughout the country - in Dublin, Cork, Limerick and Galway. A Grafton Street landmark, Brown Thomas Dublin is the flagship store. Say 'hello' to the doorman (yep, it's that kind of classy), step inside and you'll be treated to an unparalleled range of designer goods, immaculately presented. 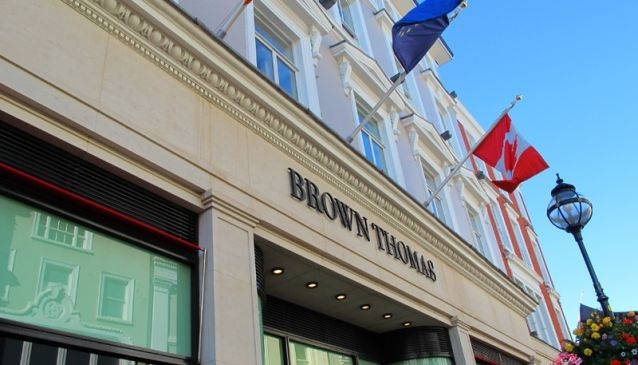 Loved as much at home as it is by international visitors, Brown Thomas has long been established as a landmark destination for both Irish trendsetters and jet-setting fashionistas. Brown Thomas represents the best luxury brands and the ultimate in innovative designers, featuring the world's most prestigious boutiques such as Hermés, Chanel and Louis Vuitton. Brown Thomas is also home to over 200 labels, carefully selected from around the globe. Should you work up an appetite looking at all this delicious designer clobber, you can pop into 'The Restaurant', a stylish and contemporary eatery with a strong focus on quality fresh, seasonal, local and Irish ingredients. Alternatively, 'Browns Bar and Café', situated on the lower ground floor, is an ideal way to enjoy some quiet time during a store visit or trip to Grafton Street. Brown Thomas has taken its place in the spotlight on the world stage of the best stores, yet it hasn't forgotten its roots - it remains quintessentially Irish.